The Peach Tree kids sofa is a great addition to your living room as it is constructed of durable timber frame. The back and the armrest of the sofa is made of selected fabric while the seat is covered with PVC leather, not only offering a reliable support but also ensuring an easy clean and maintenance. The ottoman included can be served as a stool or a mini table for toys to be placed. Lightweight as it is, the kid upholstered couch is a great companion for your baby to carry around with ease. 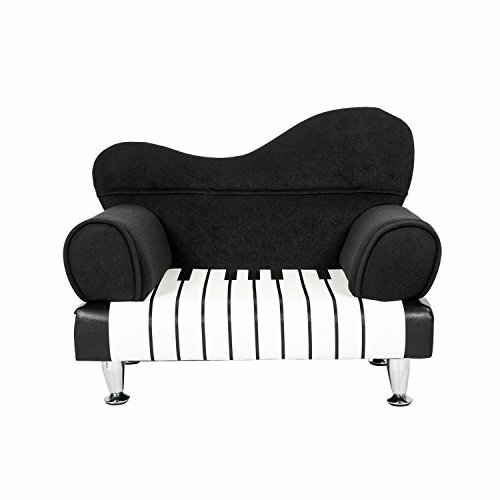 ❤Piano Design❤: The kids sofa is designed of special piano outlines, which is attractive to kids, cute in appearance. ❤Durable & Stable❤: The kids sofa is constructed of durable timber frame, with firm feet standing stable to offer a reliable use. ❤Great Comfort❤: The back and the armrest is made of soft fabric which offer a reliable support in the kids' back. Comfort fabric and superb sponge comes altogether to create a cozy place for kids to have fun. ❤Easy Clean & Maintenance❤: The seat is covered with PVC leather for an easy maintenance with a mild soap and damp cloth.